The Prince’s Trust is the UK’s leading youth charity, helping to change young lives. Our vision is that every young person should have the chance to succeed and our mission is to ‘Help young people transform their lives by developing the confidence and skills to live, learn and earn’. Our programmes offer personal development opportunities that bring lasting benefits to our young clients and their communities. ACoRP and The Prince’s Trust are embarking on a new partnership to help community rail partnerships and groups engage more with young people, and collaborate with local Prince’s Trust programmes. We believe that community rail has a great deal to offer, in enabling young people to access opportunities they might otherwise think out of reach, through sustainable, safe, inclusive transport, and through promoting skills and career pathways related to rail. A key area of The Trust’s work involves partnering with local organisations to help more young people get in to work. These partnerships are crucial, and we are keen to work with community rail partnerships and groups to promote sustainable transport and career pathways in rail. The Prince’s Trust provides a range of programmes which deliver the entire spectrum of skills and tools young people need to access the labour market. From soft skills and one-to-one support for those furthest away from being ‘work ready’, to sector specific training and qualifications to allow those that are ready and looking for work to successfully achieve their ambitions. These programmes are a vital way in which we can aid access to opportunity and help young people in to local jobs. Research by The Prince’s Trust shows that we need to empower young people and connect them to their communities, and a huge part of that is enabling access to local jobs and training. 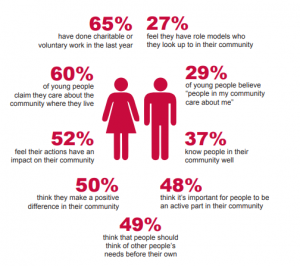 Our research also shows how much young people care about where they live and are willing to give back to the community, such as through volunteering. We are working with ACoRP because we think there is a huge opportunity for young people and their communities to benefit from being involved with community rail – so we are encouraging more community rail partnerships and station groups to work with us and young people. Community rail officers and volunteers can contact their ACoRP operations team contact (Paul, Ian, Daniel or Brian). They can provide ideas and advice on building youth involvement into your projects and plans, and link you with a local Prince’s Trust rep.